AND… I made a fool of myself. Should have read more carefully. Sorry. Move along. Nothing to see. I am not sure I know what you mean? James, thank you for sharing this info. I’m glad to see ‘A Dish Best Served Cold’ is doing well! I really enjoyed reading that adventure. There are some great encounters in it! Hey thanks for the kind words! Always happy to open the books! Excellent and very interesting update – cheers! I Just ran Tales of Good and Evil at my FLGS, and everyone really enjoyed it. The Cloisternooks are among my favorite NPCs in any of the AL content I’ve run. After playing it at a con recently, It was my first choice when I needed to run something at the shop. 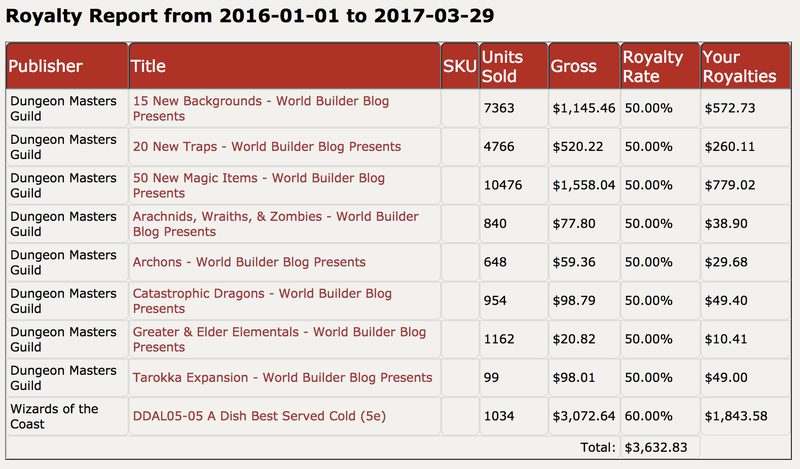 I have info (direct from OBS – DMs Guild) that the medal counts are 51, 101, 251, 501 & 1001. 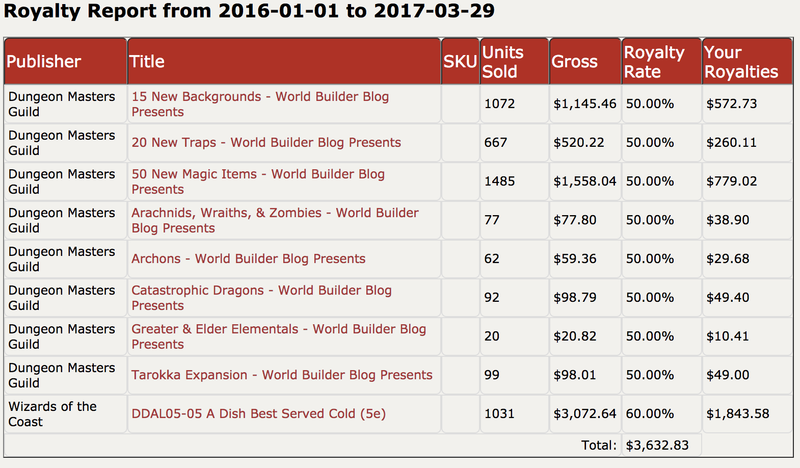 Keep in mind, though, that should someone buy an item on DMs Guild and then CHECKOUT through any sister site (RPGNow, DrivethroughRPG, etc.) that sale does NOT count toward the medal count. This is why after selling 104 items of a title, I still do not have Silver Medal status. Meaning at least 4 of these sales were completed through a checkout cart on a sister site. That is interesting! I know their site says that medal levels aren’t just “a simple doubling” of the numbers, but I guess they are! Somehow I knew that was going to be said! Thanks for taking the time to post an update on your sales. I really appreciate your transparency. I have a mix of 26 priced and free products available on the DMs Guild, so I’m always interested to hear about the sales of other authors. I tried PWYW at the start but changed in the middle of 2016. I don’t honestly know how much difference it made in sales, but I think it helped me appreciate my own work as an author. Much like you, I was lucky enough to be able to write an adventure (HULB1-1 Hulburg Rebuilding) for Baldman Games last summer. It hasn’t made me rich, but it was nice to have the opportunity to work with some great people (Shawn Merwin is one heck of a nice guy). I haven’t had the chance to write for an official AL story season yet, but hopefully one day I will. I know the standard AL adventures sell better than the CCC adventures, but A Dish Best Served Cold really is a gem, and I’m sure that helped your sales more than a bit. I’ve played and DMed it twice. It’s good fun, and it contains a great magic item! Good luck on your future products, and keep up the good work. Thanks very much, Dave! Hulberg is really great! Thanks for kicking it off!